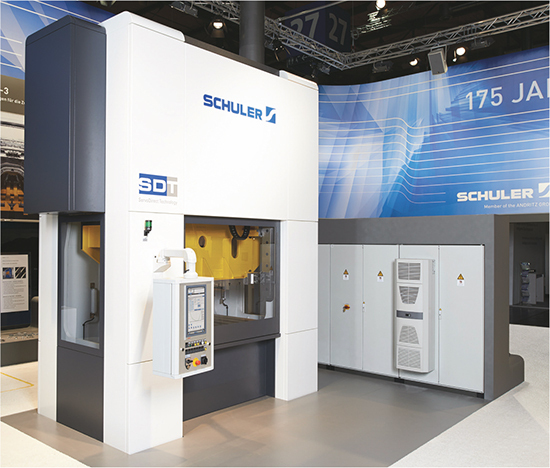 Fifty-percent less energy consumption, longer die service life and greater precision—these are the benefits offered by Schuler Beutler’s newly developed MSC-2000 automatic blanking press. Boasting the firm’s ServoDirect technology, the new press features two electrically coupled and freely programmable pressure points without gear transmission. By linking the pressure points in the press uprights, the machine’s rigidity reportedly has been significantly increased. The innovation recently received the “Award to EuroBLECH” in the category blanking, by the trade magazines blechnet and MM MaschinenMarkt, at the EuroBlech 2014 tradeshow in Hannover, Germany. The play-free and lubrication-free drivetrain comprises a highly dynamic servo motor, brake module and eccentric shaft with connecting rods, knuckle-joint and slide. The blanking press uses two such drivetrains facing each other and synchronized via the drive control, which deliver a press force of 2000 kN. Included are programmed profiles for knuckle-joint standard, blanking, coining, bending and drawing processes. After adapting the slide motion to the workpiece, the servo direct drive enables the user to raise the speed in oscillating mode. And, thanks to the freely programmable slide movement, dies can be set up quickly in production.